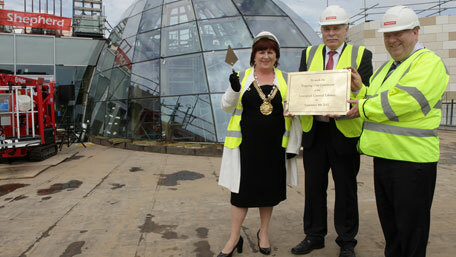 Left to right: Lord Mayor of Liverpool Councillor Sharon Sullivan, Phil Greer, managing director for Shepherd Construction, Mayor of Liverpool Joe Anderson. Construction of the top of the new build element of the scheme is now complete and includes a brand new 1,880sq ft glass dome 26 metres above ground level, and a beautiful roof terrace overlooking the city. To mark the completion of the highest point of the library, a topping out ceremony took place on Tuesday 4 September, on the roof terrace. The £50m scheme began in the autumn of 2010 and so far work has included demolishing the 1950s Brown Library and the 1978 extension. Nearing completion is a new building behind the original listed historic façade which was damaged in World War II and suffered from damp. Final fittings and fixtures are taking place in the Picton and Hornby libraries, the Oak Room and the Clayton Stack. In the Picton Reading Room, the intricate domed ceiling has been painstakingly restored and all the timber bookcases repaired. Thousands of hours of work have also gone in to matching plaster and paint as close to the originals used when the dome was built in 1875. Finishing touches are now being made to the main library room, ramps in the children’s library are being installed and landscaping outside the venue is also taking place. The literary wall is in place and can be seen at the back of the building and the ground is currently being prepared at the front of the venue for the installation of the literary pavement – a 22 metre long, 4.5meter wide walkway which will have engraved on it titles from world books, cinema and music which have been selected by local people. Mayor of Liverpool, Joe Anderson, said: “This is a massive project taking place in one of the most significant and prominent libraries in the country. “Central Library is one of the city’s jewels and after many months of hard work behind the scenes it’s wonderful to be able to see changes taking shape and start to get a sense of how wonderful the final result is going to be. “Additions to the library such as the roof terrace and children’s library will give the building a whole new dimension, making it a must visit building for anyone interested in learning, research and discovery. The library is set to reopen to the public in the spring of 2013, after the books and historic items are returned, the library and archive services are fully established and tested. Main contractor Shepherd Construction are responsible for the building work, including the full restoration of the Grade II listed parts of the building, which date back to 1860. The famous Hornby Library and Oak Reading Rooms will be fully open to the public for the first time. The revamped Central Library will also include a new home for the Liverpool Record Office which will house 14km of archives and some of the city’s most historic treasures from the last 800 years - such as the original 1207 charter - in purpose built secure, climate controlled storage. There will also be state-of-the-art IT facilities with full wi-fi and increased access to computers. The work is being carried out by the Inspire Partnership, which is a joint venture between Amber Infrastructure and Shepherd Construction with architects at Austin-Smith:Lord and Cofely as providers of Facilities Management services. Liverpool is the first city to negotiate a City Deal with the Government. It has seen a Mayor elected to oversee a single investment programme of public and private funds worth £130m with the potential to grow to £500m - £1bn; the first Mayoral Development Corporation outside London; chairing a new investment board bringing together all of the city’s assets and developing a new approach to welfare reform. For more information visit www.liverpool.gov.uk/mayor.